Not to be confused with Sholay (1984 film). Sholay ( pronunciation (help·info), lit. Embers) is a 1975 Indian action-adventure film, written by Salim-Javed, directed by Ramesh Sippy, and produced by his father G. P. Sippy. The film is about two criminals, Veeru and Jai (played by Dharmendra and Amitabh Bachchan, respectively), hired by a retired police officer (Sanjeev Kumar) to capture the ruthless dacoit Gabbar Singh (Amjad Khan). Hema Malini and Jaya Bhaduri also star, as Veeru and Jai's love interests, respectively. Sholay is considered a classic and one of the best Indian films. It was ranked first in the British Film Institute's 2002 poll of "Top 10 Indian Films" of all time. In 2005, the judges of the 50th Filmfare Awards named it the Best Film of 50 Years. The screenplay was written by screenwriter pair Salim-Javed, consisting of Salim Khan and Javed Akhtar. Their screenplay was initially rejected by several producers and directors, before they met Ramesh Sippy and his father G. P. Sippy, both of whom liked the script and wanted to direct and produce it, respectively. The film was shot in the rocky terrain of Ramanagara, in the southern state of Karnataka, over a span of two and a half years. After the Central Board of Film Certification mandated the removal of several violent scenes, Sholay was released with a length of 198 minutes. In 1990, the original director's cut of 204 minutes became available on home media. When first released, Sholay received negative critical reviews and a tepid commercial response, but favourable word-of-mouth publicity helped it to become a box office success. It broke records for continuous showings in many theatres across India, and ran for more than five years at Mumbai's Minerva theatre. The film was also an overseas success in the Soviet Union. It was the highest-grossing Indian film ever at the time, and was the highest-grossing film in India up until Hum Aapke Hain Koun..! (1994). By some accounts, Sholay remains the highest-grossing Indian film of all time, adjusted for inflation. The film is a Dacoit Western (sometimes called a "Curry Western"), combining the conventions of Indian dacoit films with that of Spaghetti Westerns along with elements of Samurai cinema. Sholay is also a defining example of the masala film, which mixes several genres in one work. Scholars have noted several themes in the film, such as glorification of violence, conformation to feudal ethos, debate between social order and mobilised usurpers, homosocial bonding, and the film's role as a national allegory. The combined sales of the original soundtrack, scored by R. D. Burman, and the dialogues (released separately), set new sales records. The film's dialogues and certain characters became extremely popular, contributing to numerous cultural memes and becoming part of India's daily vernacular. In January 2014, Sholay was re-released to theatres in the 3D format. Sanjeev Kumar as Thakur Baldev Singh, usually addressed as "Thakur"
Helen in a special appearance in song "Mehbooba Mehbooba"
Jalal Agha in a special appearance in song "Mehbooba Mehbooba"
The screenwriter pair Salim-Javed, consisting of Salim Khan and Javed Akhtar, began narrating the idea for Sholay as a four-line snippet to filmmakers in 1973. The idea was rejected by two producer/director teams, including directors Manmohan Desai and Prakash Mehra. About six months after the release of Zanjeer (1973), Salim-Javed got in touch with G. P. Sippy and his son Ramesh Sippy, and narrated the four-line snippet to them. Ramesh Sippy liked the concept of Sholay and hired them to develop it. The original idea of the film involved an army officer who decided to hire two ex-soldiers to avenge the murder of his family. The army officer was later changed to a policeman because Sippy felt that it would be difficult to get permission to shoot scenes depicting army activities. Salim-Javed completed the script in one month, incorporating names and personality traits of their friends and acquaintances. The film's script and dialogues are in Hindi-Urdu, primarily Urdu. Salim-Javed wrote the dialogues in Urdu script, which was then transcribed by an assistant into Devanagari script so that Hindi readers could read the Urdu dialogues. The film's plot was loosely styled after Akira Kurosawa's 1954 Samurai cinema film, Seven Samurai. It is a defining example of the Dacoit Western film, combining the conventions of Indian dacoit films, especially Mehboob Khan's Mother India (1957) and Dilip Kumar's Gunga Jumna (1961), with that of Westerns, especially Sergio Leone's Spaghetti Westerns such as Once Upon a Time in the West (1968) as well as The Magnificent Seven (1960). It also some plot elements borrowed from the Indian films Mera Gaon Mera Desh (1971) and Khote Sikkay (1973). A scene depicting an attempted train robbery was inspired by a similar scene in Gunga Jumna, and has also been compared to a similar scene in North West Frontier (1959). A scene showing the massacre of Thakur's family has been compared with the massacre of the McBain family in Once Upon a Time in the West. Sholay may have also been influenced by Sam Peckinpah's Westerns, such as The Wild Bunch (1969) and Pat Garrett and Billy the Kid (1973), and George Roy Hill's Butch Cassidy and the Sundance Kid (1969). The character Gabbar Singh was modelled on a real-life dacoit of the same name who had menaced the villages around Gwalior in the 1950s. Any policeman captured by the real Gabbar Singh had his ears and nose cut off, and was released as a warning to other policemen. The character was also inspired by Gunga Jumna, where Dilip Kumar's character Gunga is a dacoit speaking with a similar dialect, a mix of Khariboli and Awadhi. The character was also influenced by the villain "El Indio" (played by Gian Maria Volonté) of Sergio Leone's For a Few Dollars More (1965). Sippy wanted to do away with the cliched idea of a man becoming a dacoit due to societal issues, as was the case in other films, and focused on Gabbar being an emblem of pure evil. To drive home the point of Gabbar being a new type of villain, Sippy also did away with the typical tropes of dacoits wearing dhotis and pagris and sporting a Tika and worshipping "Ma Bhavani"; Gabbar would be wearing army fatigues. The character of jailer, played by Asrani was influenced by Adolf Hitler, Javed Akhtar brought a book on World War II which had several pictures of Hitler posing to set the typical posture of the character in the film. Asrani spiced up his character with some ideas about Hitler's speech delivery he had heard from a teacher in FTII. The trademark 'Ha Ha' at the end of his monologues was inspired by a similar performance by Jack Lemmon in The Great Race. Soorma Bhopali, a minor comic relief character, was based on an acquaintance of actor Jagdeep, a forest officer from Bhopal named Soorma. The real-life Soorma eventually threatened to press charges when people who had viewed the film began referring to him as a woodcutter. The main characters' names, Jai and Veeru, mean "victory" and "heroism" in Hindi. The producers considered Danny Denzongpa for the role of bandit chief Gabbar Singh, but he could not accept it as he was committed to act in Feroz Khan's Dharmatma (1975), under production at the same time. Amjad Khan, who was the second choice, prepared himself for the part by reading the book Abhishapta Chambal, which told of the exploits of Chambal dacoits. The book was written by Taroon Kumar Bhaduri, the father of fellow cast member Jaya Bhaduri. Sanjeev Kumar also wanted to play the role of Gabbar Singh, but Salim-Javed "felt he had the audience's sympathy through roles he'd done before; Gabbar had to be completely hateful." Sippy wanted Shatrughan Sinha to play the part of Jai, but there were already several big stars signed, and Amitabh Bachchan, who was not very popular yet, lobbied hard to get the part for himself. He was cast after Salim-Javed recommended him for Sholay in 1973; Bachchan's performance in their first collaboration, Zanjeer, convinced Salim-Javed he was the right actor for the film. Salim-Javed were impressed with Bachchan's performance in Raaste Kaa Patthar (1972), and at Bachchan's request, Dharmendra had personally put in a word for him. All these factors ensured that the role was Bachchan's. As cast members had read the script ahead of time, many were interested in playing different parts. Pran was considered for the role of Thakur Baldev Singh, but Sippy thought Sanjeev Kumar was a better choice. Initially, Salim-Javed approached Dilip Kumar to play Thakur's role, but he turned down the offer; Dilip Kumar later said it was one of the few films he regretted turning down. Initially, Dharmendra was also interested to play the role of Thakur. He eventually gave up the role when Sippy informed him that Sanjeev Kumar would play Veeru if that happened, and would be paired with Hema Malini, who Dharmendra was trying to woo. Dharmendra knew that Kumar was also interested in Malini. Hema Malini was reluctant to play the role of a tangewali, more so after Sippy told her that the film belongs to Sanjeev Kumar and Amjad Khan, but she trusted Sippy to give her a meaty role, given that he had played a huge role in essaying her stardom. During the film's production, four of the leads became romantically involved. Bachchan married Bhaduri four months before filming started. This led to shooting delays when Bhaduri became pregnant with their daughter Shweta. By the time of the film's release, she was pregnant with their son Abhishek. Dharmendra had begun wooing Malini during their earlier film Seeta Aur Geeta (1972), and used the location shoot of Sholay to further pursue her. During their romantic scenes, Dharmendra would often pay the light boys to spoil the shot, thereby ensuring many retakes and allowing him to spend more time with her. The couple married five years after the film's release. Ramdevarabetta, near the town of Ramanagara; much of Sholay was shot in rocky locations such as this. Much of Sholay was shot in the rocky terrain of Ramanagara, a town near Bangalore, Karnataka. The filmmakers had to build a road from the Bangalore highway to Ramanagara for convenient access to the sets. Art director Ram Yedekar had an entire township built on the site. A prison set was constructed near Rajkamal Studio in Mumbai, also outdoors, to match the natural lighting of the on-location sets. One part of Ramanagara was for a time called "Sippy Nagar" as a tribute to the director of the film. As of 2010[update], a visit to the "Sholay rocks" (where much the film was shot) was still being offered to tourists travelling through Ramanagara. Filming began on location on 3 October 1973, with a scene featuring Bachchan and Bhaduri. The film had a lavish production for its time (with frequent banquets and parties for the cast), took two and a half years to make, and went over budget. One reason for its high cost was that Sippy re-filmed scenes many times to get his desired effect. "Yeh Dosti", a 5-minute song sequence, took 21 days to shoot, two short scenes in which Radha lights lamps took 20 days to film because of lighting problems, and the shooting of the scene in which Gabbar kills the imam's son lasted 19 days. The train robbery sequence, shot on the Mumbai–Pune railway route near Panvel, took more than 7 weeks to complete. Sholay was the first Indian film to have a stereophonic soundtrack and to use the 70 mm widescreen format. However, since actual 70 mm cameras were expensive at the time, the film was shot on traditional 35 mm film and the 4:3 picture was subsequently converted to a 2.2:1 frame. Regarding the process, Sippy said, "A 70mm [sic] format takes the awe of the big screen and magnifies it even more to make the picture even bigger, but since I also wanted a spread of sound we used six-track stereophonic sound and combined it with the big screen. It was definitely a differentiator." The use of 70 mm was emphasised by film posters on which the name of the film was stylised to match the CinemaScope logo. Film posters also sought to differentiate the film from those which had come before; one of them added the tagline: "The greatest star cast ever assembled – the greatest story ever told". Scholars have noted several themes in the film, such as glorification of violence, conformation to feudal ethos, debate between social order and mobilised usurpers, homosocial bonding, and the film's role as a national allegory. Koushik Banerjea, a sociologist in the London School of Economics, notes that Sholay exhibits a "sympathetic construction of 'rogue' masculinity" exemplified by the likeable outlaws Jai and Veeru. Banerjea argues during the film, the moral boundary between legality and criminality gradually erodes. Film scholar Wimal Dissanayake agrees that the film brought "a new stage in the evolving dialectic between violence and social order" to Indian cinema. Film scholar M. Madhava Prasad states that Jai and Veeru represent a marginalised population that is introduced into conventional society. Prasad says that, through the elements of revenge included in the plot and the application of Jai and Veeru's criminality for the greater good, the narrative reflects reactionary politics, and the audience is compelled to accept feudal order. Banerjea explains that though Jai and Veeru are mercenaries, they are humanised by their emotional needs. Such dualism makes them vulnerable, in contrast to the pure evil of Gabbar Singh. Gabbar Singh, the film's antagonist, was well received by the audience, despite his pervasive sadistic cruelty. Dissanayake explains that the audience was fascinated by the dialogues and mannerisms of the character, and this element of spectacle outweighed his actions, a first for Indian melodrama. He notes that the picturisation of violence in the film was glamourised and uninhibited. He further notes that, unlike earlier melodramas in which the female body occupies the audience's attention as an object of male fetish, in Sholay, the male body becomes the centrepiece. It becomes the battleground where good and evil compete for supremacy. Dissanayake argues that Sholay can be viewed as a national allegory: it lacks a comforting logical narrative, it shows social stability being repeatedly challenged, and it shows the devaluation of human life resulting from a lack of emotions. Taken together, these elements comprise the allegorical representation of India. The narrative style of Sholay, with its violence, revenge, and vigilante action, is occasionally compared by scholars to the political unrest in India at the time of its release. This tension culminated in the Emergency (rule by decree) declared by prime minister Indira Gandhi in 1975. Dissanayeke and Sahai note that, although the film borrowed heavily from the Hollywood Western genre, particularly in its visuals, it was successfully "Indianised". As an example, William van der Heide has compared a massacre scene in Sholay with a similar scene in Once Upon a Time in the West. Although both films were similar in technical style, Sholay emphasised Indian family values and melodramatic tradition, while the Western was more materialistic and restrained in its approach. Maithili Rao, in Encyclopedia of Hindi Cinema, notes that Sholay infuses the style of the Western genre into a "feudalistic ethos". Ted Shen of the Chicago Reader notes Sholay's "hysterical visual style" and intermittent "populist message". Cultural critic and Islamic scholar Ziauddin Sardar lampoons the film in his book The Secret Politics of Our Desires: Innocence, Culpability and Indian Popular Cinema, both for its caricature and stereotyping of Muslim and women characters, and for what he calls mockery of innocent villagers. Sardar notes that the two most prominent Muslim characters in the film are Soorma Bhopali (a buffoonish criminal), and an impotent victim of the bandits (the imam). Meanwhile, the sole function of one female character (Radha) is to suffer her fate in silence, while the other female lead (Basanti) is just a garrulous village belle. Some scholars have indicated that Sholay contains homosocial themes. Ted Shen describes the male bonding shown in the film as bordering on camp style. Dina Holtzman, in her book Bollywood and Globalization: Indian Popular Cinema, Nation, and Diaspora, states that the death of Jai, and resultant break of bonding between the two male leads, is necessary for the sake of establishing a normative heterosexual relationship (that of Veeru and Basanti). R. D. Burman composed the film's music, and the lyrics were written by Anand Bakshi. The songs used in the film, and released on the original soundtrack are listed below. Following that is a list of unused tracks and dialogues which were released later on an updated soundtrack. The song "Mehbooba Mehbooba" was sung by its composer, R. D. Burman, who received his sole Filmfare Award nomination for playback singing for his effort. The song, which is often featured on Bollywood hit song compilations, is based on "Say You Love Me" by Greek singer Demis Roussos. "Mehbooba Mehbooba" has been extensively anthologised, remixed, and recreated. A version was created in 2005 by the Kronos Quartet for their Grammy-nominated album You've Stolen My Heart, featuring Asha Bhosle. It was also remixed and sung by Himesh Reshammiya, along with Bhosle, in his debut acting film Aap Kaa Surroor (2007). "Yeh Dosti" has been called the ultimate friendship anthem. It was remixed and sung by Shankar Mahadevan and Udit Narayan for the 2010 Malayalam film Four Friends, and also in 2010 it was used to symbolise India's friendship with the United States during a visit from President Barack Obama. Several songs from the soundtrack were included in the annual Binaca Geetmala list of top filmi songs. "Mehbooba Mehooba" was listed at No. 24 on the 1975 list, and at No. 6 on the 1976 list. "Koi Haseena" was listed at No. 30 in 1975, and No. 20 in 1976. "Yeh Dosti" was listed at No. 9 in 1976. Despite the soundtrack's success, at the time, the songs from Sholay attracted less attention than the film's dialogue—a rarity for Bollywood. The producers were thus prompted to release records with only dialogue. Taken together, the album sales reached an unprecedented 500,000 units. By 1979, the soundtrack went Platinum (equivalent to 1 million sales at the time), becoming one of the top-selling Bollywood soundtracks of the 1970s. Music critic Oli Marlow reviewed the soundtrack in 2013, calling it a unique fusion of religious, folk, and classical music, with influences from around the world. He also commented on the sound design of the film, calling it psychedelic, and saying that there was "a lot of incredible incidental music" in the film that was not included in the soundtrack releases. In a 1999 paper submitted to London's Symposium on Sound in Cinema, film critic Shoma A. Chatterji said, "Sholay offers a model lesson on how sound can be used to signify the terror a character evokes. Sholay is also exemplary in its use of soundmatching to jump cut to a different scene and time, without breaking the continuity of the narrative, yet, intensifying the drama." Sholay was released on 15 August 1975, Indian Independence Day, in Mumbai. Due to lacklustre reviews and a lack of effective visual marketing tools, it saw poor financial returns in its first two weeks. From the third week, however, viewership picked up owing to positive word of mouth. During the initial slow period, the director and writer considered re-shooting some scenes so that Amitabh Bachchan's character would not die. When business picked up, they abandoned this idea. After being helped additionally by a soundtrack release containing dialogue snippets, Sholay soon became an "overnight sensation". The film was then released in other distribution zones such as Delhi, Uttar Pradesh, Bengal, and Hyderabad on 11 October 1975. It became the highest-grossing Bollywood film of 1975, and film ranking website Box Office India has given the film a verdict of "All Time Blockbuster". Sholay went on to earn a still-standing record of 60 golden jubilees[c] across India, and was the first film in India to celebrate a silver jubilee[d] at over 100 theatres. It was shown continuously at Mumbai's Minerva theatre for over five years. Sholay was the Indian film with the longest theatrical run until Dilwale Dulhania Le Jayenge (1995) broke its record of 286 weeks in 2001. Exact figures are not available on the budget and box office earnings of Sholay, but film trade sources provide estimates of its success. According to Box Office India, Sholay earned about ₹150 million in net income[e] (valued at about US$16,778,000 in 1975)[b] in India during its first run, which was many times its ₹30 million (valued at about US$3,355,000 in 1975)[b] budget. Those earnings were a record that remained unbroken for nineteen years, which is also the longest amount of time that a film has held the record. Its original gross was increased further with re-releases during the late 1970s, 1980s, 1990s, and early 2000s. The film's total gross revenue in India amounted to ₹350 million ($39.15 million). [b] Box Office India estimates the film's total footfalls in India as over 100 million tickets sold. The film was also an overseas success in the Soviet Union, where it was released in 1979. The film sold 48.4 million tickets during its initial run at the Soviet box office, before eventually selling 60 million tickets including re-runs. The film was also released in China, as two parts in 1988. It was the highest-grossing Indian film ever up until Disco Dancer (1982), and the highest-grossing film in India up until Hum Aapke Hain Koun..! (1994). It is often cited that, after adjusting the figures for inflation, Sholay remains one of the highest-grossing films in the history of Indian cinema, although such figures are not known with certainty. Box Office India estimated ₹1.63 billion as Sholay's adjusted domestic net income in 2008,[e] while Times of India estimated over ₹3 billion as the adjusted domestic gross in 2009. Mid Day estimated the film's total adjusted gross as ₹15 billion ($246 million) in 2014. In terms of footfalls, the film is estimated to have sold over 100 million tickets in India, in addition to 60 million tickets in the Soviet Union. In 1985, India Today estimated that the film drew a total audience of 250 million, which is comparable to the number of tickets sold by some of the world's highest-grossing films of all time adjusted for inflation. Initial critical reviews of Sholay were negative. Among contemporary critics, K.L. Amladi of India Today called the film a "dead ember" and "a gravely flawed attempt". Filmfare said that the film was an unsuccessful mincing of Western style with Indian milieu, making it an "imitation western—neither here nor there." Others labelled it as "sound and fury signifying nothing" and a "second-rate take-off" of the 1971 film Mera Gaon Mera Desh. Trade journals and columnists initially called the film a flop. In a 1976 article in the journal Studies: An Irish Quarterly Review, author Michael Gallagher praised the technical achievement of the film, but otherwise criticised it stating, "As a spectacle it breaks new ground, but on every other level it is intolerable: formless, incoherent, superficial in human image, and a somewhat nasty piece of violence". Over time, the critical reception to Sholay greatly improved; it is now considered a classic, and among the greatest Hindi-language films. In a 2005 BBC review, the well-rounded characters and simple narrative of the film were commended, but the comical cameos of Asrani and Jagdeep were considered unnecessary. On the film's 35th anniversary, the Hindustan Times wrote that it was a "trailblazer in terms of camera work as well as music," and that "practically every scene, dialogue or even a small character was a highlight." In 2006, The Film Society of Lincoln Center described Sholay as "an extraordinary and utterly seamless blend of adventure, comedy, music and dance", labelling it an "indisputable classic". Chicago Review critic Ted Shen criticised the film in 2002 for its formulaic plot and "slapdash" cinematography, and noted that the film "alternates between slapstick and melodrama". In their obituary of the producer G.P. 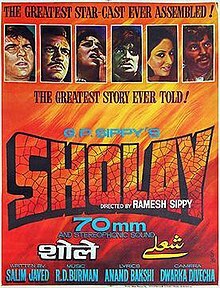 Sippy, the New York Times said that Sholay "revolutionized Hindi filmmaking and brought true professionalism to Indian script writing". Sholay was nominated for nine Filmfare Awards, but the only winner was M. S. Shinde, who won the award for Best Editing. The film also won three awards at the 1976 Bengal Film Journalists' Association Awards (Hindi section): "Best Actor in Supporting Role" for Amjad Khan, "Best Cinematographer (Colour)" for Dwarka Divecha, and "Best Art Director" for Ram Yedekar. Sholay received a special award at the 50th Filmfare Awards in 2005: Best Film of 50 Years. Sholay has received many "Best Film" honours. It was declared the "Film of the Millennium" by BBC India in 1999. It topped the British Film Institute's "Top 10 Indian Films" of all time poll of 2002, and was voted the greatest Indian movie in a Sky Digital poll of one million British Indians in 2004. It was also included in Time Magazine's "Best of Bollywood" list in 2010, and in CNN-IBN's list of the "100 greatest Indian films of all time" in 2013. Sholay inspired many films and pastiches, and spawned a genre of films, the "Curry Western", which is a play on the term Spaghetti Western. A more accurate label for the genre is the Dacoit Western, due to its roots in earlier Indian dacoit films such as Mother India (1957) and Gunga Jumna (1961). It was also an early and most definitive masala film, and a trend-setter for "multi-star" films. The film was a watershed for Bollywood's scriptwriters, who were not paid well before Sholay; after the film's success, its writing duo Salim-Javed became stars in their own right and script writing became a more respected profession. The BBC has described Sholay as the "Star Wars of Bollywood", comparing its impact on Bollywood to the impact that Star Wars (1977) later had on Hollywood, while comparing Gabbar Singh to Darth Vader. A line of Gabbar Singh (Tera kya hoga, meaning, "What will happen to you?") and a picture of him is painted on the back of an auto rickshaw, a common mode of public transport. Dialogues and characters from the film have contributed to many cultural tropes in India's daily life. Certain scenes and dialogues from the film earned iconic status in India, such as "Kitne aadmi the" (How many men were there? ), "Jo dar gaya, samjho mar gaya" (One who is scared is dead), and "Bahut yaarana laagta hai" (Looks like you two are very close) – all dialogues of Gabbar Singh. These and other popular dialogues entered the people's daily vernacular. Characters and dialogues from the film continue to be referred to and parodied in popular culture. Gabbar Singh, the sadistic villain, ushered in an era in Hindi films characterised by "seemingly omnipotent oppressors as villains", who play the pivotal role in setting up the context of the story, such as Shakal (played by Kulbhushan Kharbanda) of Shaan (1980), Mogambo (Amrish Puri) of Mr. India (1987) and Bhujang (Amrish Puri) of Tridev (1989). Filmfare, in 2013, named Gabbar Singh the most iconic villain in the history of Indian cinema, and four actors were included in its 2010 list of "80 Iconic Performances" for their work in this film. The film is often credited with making Amitabh Bachchan a "superstar", two years after he became a star with Zanjeer (1973). Some of the supporting actors remained etched in public memory as the characters they played in Sholay; for example, Mac Mohan continued to be referred to as "Sambha", even though his character had just one line. Major and minor characters continue to be used in commercials, promos, films and sitcoms. Amjad Khan acted in many villainous roles later in his career. He also played Gabbar Singh again in the 1991 spoof Ramgarh Ke Sholay, and reprised the role in commercials. The British Film Institute in 2002 wrote that fear of Gabbar Singh "is still invoked by mothers to put their children to sleep". The 2012 film Gabbar Singh, named after the character, became the highest grossing Telugu film up to that point. Comedian Jagdeep, who played Soorma Bhopali in the film, attempted to use his Sholay success to create a spinoff. He directed and played the lead role in the 1988 film Soorma Bhopali, in which Dharmendra and Bachchan had cameos. In 2004, Sholay was digitally remastered and shown again to packed theatres in India, including Mumbai's Minerva, where it had run successfully 29 years earlier. An attempt to remake Sholay, Ram Gopal Varma's film Aag (2007), starring Amitabh Bachchan as the villain, was a commercial and critical disaster. Because of television and home media, Sholay is widely available and still popular. Twenty years after its release, Sholay was first shown on the Indian DD National television channel, where it drew the highest ratings ever for an Indian film broadcast. Video game producer Mobile2win released the "Sholay Ramgarh Express" game for mobile phones in 2004, along with other Sholay themed content such as wallpapers, video clips, and ringtones. Sholay has been the subject of two books and many articles. Wimal Dissanayake and Malti Sahai's Sholay, A Cultural Reading (1992) attempts a comprehensive scholarly study that sets the film within the broader history of popular cinema in India. Anupama Chopra's Sholay: The Making of a Classic (2000) provides an inside look at the film's production based on interviews with the director, stars, and crew members. Sholay has been labelled by Chopra as the gold standard in Indian cinema, and a reference point for audiences and trade analysts. Over the years, the film has reached a mythic stature in popular culture, and has been called the greatest Hindi film of all time. It belongs to only a small collection of films, including Kismet (1943), Mother India (1957), Mughal-e-Azam (1960) and Hum Aapke Hain Koun..! (1994), which are repeatedly watched throughout India, and are viewed as definitive Hindi films with cultural significance. The lasting effect of Sholay on Indian cinema was summarised by Anupama Chopra, when in 2004 she called it "no longer just a film, [but] an event". In the 2000 book Sholay: The Making of a Classic, the noted director Shekhar Kapur stated "there has never been a more defining film on the Indian screen. Indian film history can be divided into Sholay BC and Sholay AD". The film was jointly released in Pakistan by Geo films and Mandviwalla Entertainment on 17 April 2015, almost 40 years after its theatrical release. The film's premiere in the country was held in Karachi. Filmmaker Ketan Mehta's company Maya Digital was responsible for converting Sholay into the 3D format. Mehta was approached by G. P. Sippy's grandson, Sasha Sippy, about the project in 2010. In March 2012, Shaan Uttam Singh, the grandson of producer G. P. Sippy, said that he would sponsor a conversion of the film to 3D, and release it in late 2012; this was later postponed to late 2013, and eventually finalised for 3 January 2014. It took ₹250 million (US$3.5 million) to convert Sholay to 3D. Under the leadership of computer animator Frank Foster, 350 people worked to convert the film into the digital 3D format, for which every scene had to be individually restored, colour-corrected and re-composited in 3D to match the depth. [f] New set-pieces, particularly those suited to the new format were also included, such as digital logs which scatter in the direction of the camera during the first half of the film when the train collides with them, the gunshot scene which frees Jai and Veeru from their handcuffs, and panoramic views of Gabbar's hideout in the caves. The theatrical trailer and release date were unveiled by the original script-writers Salim Khan and Javed Akhtar. The two original leads, Bachchan and Dharmendra, were also involved in promoting the re-release. The film was released in 1,000 screens in India, and additional screens overseas. It earned approximately ₹100 million (US$1.4 million) during its re-release, not enough to recover its conversion cost. ^ a b The British Board of Film Classification (BBFC) notes three running times of Sholay. The version that was submitted in film format to BBFC had a running time of 198 minutes. A video version of this had a running time of 188 minutes. BBFC notes that "When a film is transferred to video the running time will be shorter by approximately 4% due to the differing number of frames per second. This does not mean that the video version has been cut or re-edited." The director's cut was 204 minutes long. ^ a b c d The exchange rate in 1975 was 8.94 Indian rupees (₹) per 1 US dollar (US$). ^ A golden jubilee means that a film has completed 50 consecutive weeks of showing in a single theatre. ^ A silver jubilee means that a film has completed 25 consecutive weeks of showing in a single theatre. ^ a b According to the website Box Office India, film tickets are subject to "entertainment tax" in India, and this tax is added to the ticket price at the box office window of theatres. The amount of this tax is variable among states. "Nett gross figures are always after this tax has been deducted while gross figures are before this tax has been deducted." Although since 2003 the entertainment tax rate has significantly decreased, as of 2010, gross earnings of a film can be 30–35% higher than nett gross, depending on the states where the film is released. ^ The 3D version of the film has a run-time of 198 minutes and the original shots were of standard film frame rate, i.e. 24 frames per second, therefore this version has 285,120 frames which were digitised, upscaled to High Definition (HD) and element mapped. ^ a b "Sholay (PG)". British Board of Film Classification. Archived from the original on 9 November 2013. Retrieved 12 April 2013. ^ a b Cinar, Alev; Roy, Srirupa; Yahya, Maha (2012). Visualizing Secularism and Religion: Egypt, Lebanon, Turkey, India. University of Michigan Press. p. 117. ISBN 0472071181. Archived from the original on 30 November 2017. ^ a b Chopra 2000, p. 33. ^ a b Aḵẖtar, Jāvīd; Kabir, Nasreen Munni (2002). Talking Films: Conversations on Hindi Cinema with Javed Akhtar. Oxford University Press. p. 49. ISBN 9780195664621. Archived from the original on 8 January 2014. JA: I write dialogue in Urdu, but the action and descriptions are in English. Then an assistant transcribes the Urdu dialogue into Devnagari because most people read Hindi. But I write in Urdu. ^ a b Chopra 2000, p. 143. ^ a b c "Sholay emerges as Bollywood's most successful re-run product even after 20 years". India Today. 15 September 1995. ^ a b c "«Месть и закон» (Sholay, 1975)". KinoPoisk (in Russian). Retrieved 3 February 2019. ^ Statistical Abstract of the United States 1977, p. 917. ^ Banerjee & Srivastava 1988, pp. 166–169. ^ Sarkar, Suparno (6 April 2018). "Sholay actor Raj Kishore latest among Bollywood celebs who died in 2018". International Business Times. India. Archived from the original on 6 April 2018. Retrieved 6 April 2018. ^ a b c d Khan, Salim; Sukumaran, Shradha (14 August 2010). "Sholay, the Beginning". OPEN Magazine. Archived from the original on 30 November 2017. ^ a b c d e f Chopra 2000, pp. 22–28. ^ a b c d e Pandya, Haresh (27 December 2007). "G. P. Sippy, Indian Filmmaker Whose Sholay Was a Bollywood Hit, Dies at 93". The New York Times. Archived from the original on 28 August 2011. Retrieved 23 February 2011. ^ a b c d e f Raheja, Dinesh (9 August 2009). "Why Sholay is a cult classic". Rediff.com. Archived from the original on 4 March 2016. Retrieved 1 December 2010. ^ a b Teo, Stephen (2017). Eastern Westerns: Film and Genre Outside and Inside Hollywood. Taylor & Francis. p. 122. ISBN 9781317592266. Archived from the original on 30 November 2017. ^ Ghosh, Tapan K. (2013). Bollywood Baddies: Villains, Vamps and Henchmen in Hindi Cinema. SAGE Publications. p. 55. ISBN 9788132113263. Archived from the original on 30 November 2017. ^ a b Varma 2010, pp. 159–160. ^ a b Heide 2002, p. 52. ^ "Bollywood continues to lift from Hollywood scripts". Sify. 22 June 2009. Archived from the original on 5 December 2010. Retrieved 22 December 2010. ^ Khan 1981, pp. 88–89, 98. ^ Chopra 2000, p. 26. ^ Chopra, Anupama (11 August 2015). "Shatrughan Sinha as Jai, Pran as Thakur and Danny as Gabbar? What 'Sholay' could have been". Scroll. Archived from the original on 8 November 2015. ^ Chopra 2000, p. 38. ^ Chopra 2000, p. 37. ^ Banerjea 2005, p. 183. ^ "How 'Soorma Bhopali' and 'Calendar' were created!". Bollywood Hungama. 13 February 2013. Archived from the original on 21 November 2016. Retrieved 24 April 2013. ^ Hogan 2008, p. 90. ^ "Danny Denzongpa's loss". The Times of India. 30 August 2008. Archived from the original on 13 November 2014. Retrieved 26 January 2012. ^ Chopra 2000, p. 60. ^ Chaudhuri, Diptakirti (2015). Written by Salim-Javed: The Story of Hindi Cinema’s Greatest Screenwriters. Penguin Group. p. 93. ISBN 9789352140084. Archived from the original on 30 November 2017. ^ Chopra 2000, p. 31. ^ Chopra 2000, pp. 31–32. ^ Chopra 2000, pp. 35–36. ^ Chopra 2000, p. 30. ^ Chopra 2000, pp. 91–105. ^ "Ramgarh of Sholay to become district". The Times of India. 22 June 2007. Archived from the original on 13 October 2015. Retrieved 23 December 2008. ^ Chopra 2000, p. 45. ^ Roy 2003, p. 225. ^ "'We are not remaking Sholay...'". Rediff. 30 December 1999. Archived from the original on 21 October 2013. Retrieved 20 April 2013. ^ Mekkad, Salil (19 June 2010). "Sholay ka Ramgarh". Hindustan Times. Archived from the original on 5 October 2015. Retrieved 27 September 2010. ^ Chopra 2000, p. 64. ^ Chopra 2000, pp. 66–67. ^ a b Chopra 2000, pp. 77–79. ^ IANS (4 August 2010). "Sholay continues to smoulder". Pune Mirror. Archived from the original on 11 March 2012. Retrieved 6 December 2010. ^ a b c d e f "35 years on, the Sholay fire still burns". NDTV. 14 August 2010. Archived from the original on 12 June 2013. Retrieved 12 April 2013. ^ a b c "Sholay (1975) Region 0 DVD Review". The Digital Fix. Archived from the original on 21 November 2016. Retrieved 9 August 2010. ^ Raghavendra, Nandini (10 April 2010). "3D effect: Back to 70mm screens?". The Economic Times. Archived from the original on 13 February 2017. Retrieved 30 December 2010. ^ Mazumdar, Ranjani. "The Man Who Was Seen Too Much: Amitabh Bachchan on Film Posters (The Poster As Preview)". Tasveer Ghar. Archived from the original on 12 May 2015. Retrieved 9 May 2013. ^ a b Das, Ronjita (7 February 2001). "I didn't even know there was another ending to Sholay". Rediff. Archived from the original on 15 July 2011. Retrieved 27 September 2010. ^ Prabhakar, Jyothi (28 April 2013). "Changed 'Sholay' climax because of the Censor Board: Ramesh Sippy". The Times of India. Archived from the original on 17 August 2015. Retrieved 5 July 2013. ^ "Sholay DVD review :: zulm.net :: definitive indian dvd guide". zulm.net. 17 February 2001. Archived from the original on 11 August 2012. Retrieved 3 July 2013. ^ "Sholay". British Board of Film Classification. 25 September 2012. Archived from the original on 21 October 2013. Retrieved 11 May 2013. ^ Banerjea 2005, p. 164. ^ a b c Banerjea 2005, pp. 177–179. ^ a b c Dissanayake 1993, p. 199. ^ a b Prasad 1998, pp. 156–160. ^ a b Dissanayake 1993, p. 200. ^ Dissanayake 1993, p. 201. ^ Hayward 2006, pp. 63–64; Holtzman 2011, p. 118. ^ Dissanayake & Sahai 1992, p. 125; Dissanayake 1993, p. 197. ^ Rao 2003, p. 95. ^ a b c Shen, Ted (13 December 2002). "Sholay". Chicago Reader. Archived from the original on 4 March 2016. Retrieved 11 April 2013. ^ a b Sardar 1998, pp. 48-49. ^ Gopinath, G. (2000). "Queering Bollywood". Journal of Homosexuality. 39 (3–4): 283–297. doi:10.1300/J082v39n03_13. PMID 11133137. ^ Anjaria, U. (2012). "'Relationships which have no name': Family and sexuality in 1970s popular film". South Asian Popular Culture. 10: 23–35. doi:10.1080/14746689.2012.655103. ^ Holtzman 2011, pp. 111-113. ^ "Sholay (Original Motion Picture Soundtrack) - EP". iTunes Store. Archived from the original on 16 June 2014. Retrieved 23 April 2013. ^ "Sholay (Indian Film Soundtrack)". Amazon.com. Archived from the original on 23 February 2014. Retrieved 23 April 2013. ^ "The Best of Bollywood". Amazon.com. Archived from the original on 21 November 2016. Retrieved 22 December 2010. ^ "Sholay". Desiclub. Archived from the original on 21 October 2013. Retrieved 11 September 2006. ^ Dye, David (5 October 2005). "Kronos Quartet's Stolen Heart with Asha Bhosle". NPR. Archived from the original on 26 November 2010. Retrieved 18 December 2010. ^ Padma, Reshmi (28 October 2010). "Kamal Haasan is the highlight of Four Friends". Rediff. Archived from the original on 13 January 2012. Retrieved 24 February 2012. ^ "Sholay's 'ye dosti...' number for Obama at President's banquet". The Times of India. 8 November 2010. Archived from the original on 11 November 2010. Retrieved 19 April 2013. ^ Morcom 2007, p. 209. ^ Chopra 2000, p. 170. ^ Miglani, Surendra (17 July 2005). "Lines that linger". The Tribune. Archived from the original on 5 June 2011. Retrieved 14 December 2010. ^ Chopra 2000, p. 180. ^ "Sûrya India". Sûrya India. A. Anand. 3 (2): 61. 1979. Six years after the movie was released, 'Sholay' is still going strong. Polydor records has won a platinum disc for the sale of the 'Sholay' record — the first time such a disc has been awarded in the 75- year-old history of the Indian record industry. ^ "Music Hits 1970–1979". Box Office India. Archived from the original on 15 February 2008. Retrieved 2 September 2013. ^ Marlow, Oli (14 January 2013). "Vouch: Geiom on RD Burman's Sholay". The Sonic Router. Archived from the original on 30 July 2013. Retrieved 13 June 2013. ^ Chatterji, Shoma A. (15 April 1999). "The Culture-specific Use of Sound in Indian Cinema". FilmSound.org. Archived from the original on 6 June 2013. Retrieved 13 June 2013. ^ Chopra 2000, p. 169. ^ Chopra 2000, p. 164. ^ Chopra 2000, p. 173. ^ "Box Office 1975". Box Office India. Archived from the original on 20 October 2013. Retrieved 12 October 2012. ^ Elliott, Payne & Ploesch 2007, p. 54. ^ a b "900 not out!". The Telegraph. 3 February 2013. Archived from the original on 4 March 2016. Retrieved 11 May 2013. ^ "Box Office in India Explained". Box Office India. Archived from the original on 20 October 2013. Retrieved 14 May 2013. ^ a b "Top Earners 1970–1979 – BOI". Box Office India. Archived from the original on 14 October 2013. Retrieved 24 February 2012. ^ "About Inflation Figures – BOI". Box Office India. Archived from the original on 6 January 2014. Retrieved 24 February 2012. ^ "印度片現在這麼火也不是沒有原因的". Xuehua. 7 April 2018. Retrieved 6 March 2019. ^ "From Dangal to Sanju! Top 10 films that crossed the Rs 200 crore mark fastest". Business Today. 6 July 2018. ^ "The Biggest Blockbusters Ever In Hindi Cinema". Box Office India. Archived from the original on 14 October 2013. Retrieved 13 April 2013. ^ "Top Earners 1970–1979 – BOI". Box Office India. Archived from the original on 18 January 2008. Retrieved 24 February 2012. ^ Kazmi, Nikhat (12 January 2009). "Sholay adjusted gross". The Times of India. Archived from the original on 30 April 2014. Retrieved 23 February 2011. ^ Mitra, Sumit (31 July 1985). "After series of box-office duds, Ramesh Sippy strikes back with romantic venture Saagar". India Today. Retrieved 7 February 2019. ^ a b Chopra 2000, p. 161. ^ Chopra 2000, pp. 161–168. ^ a b Chopra 2000, p. 3. ^ Rajput, Dharmesh (17 August 2005). "Sholay (1975)". BBC. Archived from the original on 7 October 2012. Retrieved 16 April 2013. ^ "Sholay completes 35 years". Hindustan Times. 15 August 2010. Archived from the original on 5 October 2015. Retrieved 27 September 2010. ^ "Sholay". Film Society of Lincoln Center. Retrieved 21 December 2010. ^ "FILMFARE NOMINEES AND WINNER" (PDF). The Times Group. Archived (PDF) from the original on 19 October 2015. Retrieved 17 September 2015. ^ "1976: 39th Annual BFJA Awards". Bengal Film Journalists' Association. Archived from the original on 19 January 2008. Retrieved 2 December 2010. ^ "All Filmfare Awards Winners". Filmfare. Archived from the original on 27 February 2018. Retrieved 27 February 2018. ^ "Top 10 Indian Films". British Film Institute. 2002. Archived from the original on 15 May 2011. Retrieved 14 June 2012. ^ Corliss, Richard (27 October 2010). "Sholay – 1975 – Best of Bollywood". Time. Archived from the original on 28 August 2013. Retrieved 30 July 2012. ^ Dudrah & Desai 2008, p. 5; Sparks 2008, p. 157. ^ a b c Lutgendorf, Philip. "Sholay". South Asian Studies Program, University of Iowa. Archived from the original on 2 January 2015. Retrieved 8 December 2010. ^ Hayward 2006, p. 67:"In its truest sense Sholay was perhaps the first Masala movie"
^ Jain 2009, p. 62. ^ Verma, Rahul (14 August 2015). "Sholay: The Star Wars of Bollywood?". BBC. Archived from the original on 9 May 2017. Retrieved 28 November 2017. ^ Chopra 2000, pp. 4–5; Jess-Cooke 2009, p. 126. ^ Banerjee & Srivastava 1988, pp. 166–169; Jess-Cooke 2009, p. 126. ^ Chopra 2000, pp. 4–5; Ganti 2004, p. 161. ^ Zankar 2003, p. 365. ^ Hashmi, Parampara Patil (3 May 2013). "Iconic villains of Indian cinema". Filmfare. Archived from the original on 11 November 2013. Retrieved 7 July 2013. ^ "Filmfare – 80 Iconic Performances 1/10". Filmfare. 1 June 2010. Archived from the original on 21 January 2012. Retrieved 8 July 2013. ^ "Filmfare – 80 Iconic Performances 2/10". Filmfare. 3 June 2010. Archived from the original on 5 July 2010. Retrieved 8 July 2013. ^ "Filmfare – 80 Iconic Performances 6/10". Filmfare. 6 June 2010. Archived from the original on 6 May 2013. Retrieved 8 July 2013. ^ "Filmfare – 80 Iconic Performances 10/10". Filmfare. 10 June 2010. Archived from the original on 3 February 2011. Retrieved 8 July 2013. ^ "Top Actor". Box Office India. Archived from the original on 29 October 2013. Retrieved 13 October 2012. ^ "'Sambha' Mac Mohan of 'Sholay' fame dies". The Times of India. 10 May 2010. Archived from the original on 6 November 2012. Retrieved 14 May 2013. ^ Chopra 2000, pp. 4–5. ^ Khanna, Parul (6 February 2010). "The most hilarious ads ever..." Hindustan Times. Archived from the original on 25 September 2015. Retrieved 17 December 2010. ^ "1. Sholay (1975)". British Film Institute. 2002. Archived from the original on 5 August 2011. Retrieved 27 April 2013. ^ "Gabbar Singh highest grosser in south". India Today. 19 July 2012. Archived from the original on 19 July 2012. Retrieved 3 May 2013. ^ "Soorma Bhopali (1988) Cast and Crew". Bollywood Hungama. 1 January 1988. Archived from the original on 21 November 2016. Retrieved 24 February 2012. ^ "29 years later, Sholay still rules". The Indian Express. 14 August 2004. Archived from the original on 9 November 2013. Retrieved 30 December 2010. ^ "Box Office 2007". Box Office India. Archived from the original on 9 November 2013. Retrieved 20 April 2013. ^ Mahmood, Rafay (5 April 2012). "Bollywood Masterpiece: Sholay in 3D". The Express Tribune. Archived from the original on 9 November 2013. Retrieved 12 April 2013. ^ "Sholay on the go!". The Hindu. 27 September 2004. Retrieved 28 May 2013. ^ Dwyer 2005, p. 218. ^ Ahmed, Zubair (18 August 2004). "Hindi classic pulls in the crowds". BBC News. Archived from the original on 23 June 2012. Retrieved 1 December 2010. ^ Chopra 2000, back cover. ^ "'Sholay' releases in Pakistan". The Hindu. Press Trust of India. 18 April 2015. Retrieved 19 April 2015. ^ a b c d Roy, Priyanka (27 November 2013). "Sholay returns — in 3D!". The Telegraph (Calcutta) supplement t2. Archived from the original on 13 December 2013. Retrieved 7 December 2013. ^ Singh, Renu (31 March 2012). "Sholay 3D to release on Aug 15". The Times of India. Archived from the original on 2 April 2012. Retrieved 31 May 2013. ^ "'Sholay 3D' to release on Amitabh Bachchan's 71st birthday?". CNN-News18. 14 August 2013. Archived from the original on 8 May 2016. Retrieved 7 December 2013. ^ "'Sholay 3D' finally up for release in the first week of 2014". Mid Day. 6 November 2013. Retrieved 9 November 2013. ^ "Rs 25 crore spent on Sholay 3D". NDTV. 8 November 2013. Archived from the original on 13 November 2013. Retrieved 19 November 2013. ^ a b Jain, Priyanka (4 June 2012). "Sholay 3D will be more successful, says distributor". Hindustan Times. Archived from the original on 5 October 2015. Retrieved 7 December 2013. ^ Coutinho, Natasha (25 November 2013). "Sholay 3D was a tough challenge". The Asian Age. Archived from the original on 11 December 2013. Retrieved 7 December 2013. ^ "'Sholay 3D' trailer unvieled [sic] & Updates at Daily News & Analysis". DNA. 7 November 2013. Archived from the original on 11 October 2015. Retrieved 7 June 2015. ^ Mangaokar, Shalvi (22 October 2013). "Amitabh Bachchan, Dharmendra set to promote Sholay 3D". Hindustan Times. Archived from the original on 5 October 2015. Retrieved 7 December 2013. ^ "Sholay (Re-Run) Second Week Collection Details". Box Office India. 18 January 2014. Archived from the original on 1 February 2014. Retrieved 23 January 2014. Banerjea, Koushik (2005). "'Fight Club': Aesthetics, Hybridisation and the Construction of Rogue Masculinities in Sholay and Deewar". In Kaur, Raminder; Sinha, Ajay J. Bollyworld: Popular Indian Cinema Through A Transnational Lens. SAGE. ISBN 978-0-7619-3321-2. Banerjee, Shampa; Srivastava, Anil (1988). One Hundred Indian Feature Films: An Annotated Filmography. Taylor & Francis. ISBN 978-0-8240-9483-6. Chopra, Anupama (2000). Sholay – The Making of a Classic. Penguin Books, India. ISBN 0-14-029970-X. Dissanayake, Wimal (1993). "The concepts of evil and social order in Indian melodrama: an evolving dialectic". In Dissanayake, Wimal. Melodrama and Asian Cinema. Cambridge University Press. ISBN 978-0-521-41465-4. Dissanayake, Wimal; Sahai, Malti (1992). Sholay, a cultural reading. Wiley Eastern. ISBN 978-81-224-0394-7. Dudrah, Rajinder Kumar; Desai, Jigna (2008). The Bollywood Reader. McGraw-Hill. ISBN 978-0-335-22212-4. Dwyer, Rachel (2005). One Hundred Bollywood Films. BFI. ISBN 978-1-84457-098-0. Elliott, Emory; Payne, Jasmine; Ploesch, Patricia (2007). Global migration, social change, and cultural transformation. Macmillan. ISBN 978-0-230-60054-6. Ganti, Tejaswini (2004). Bollywood: a guidebook to popular Hindi cinema. Taylor & Francis. ISBN 978-0-415-28854-5. Hayward, S (2006). Cinema Studies: The Key Concepts. Routledge. ISBN 0-415-36782-4. Hogan, Patrick Colm (2008). Understanding Indian Movies: Culture, Cognition, and Cinematic Imagination. University of TEXAS Press. ISBN 978-0-292-77955-6. Holtzman, Dina (2011). "Between Yaars: The Queering of Dosti in Contemporary Bollywood Films". In Bhattacharya Mehta, Rini; Pandharipande, Rajeshwari. Bollywood and Globalization: Indian Popular Cinema, Nation, and Diaspora. Anthem Press. ISBN 978-0-85728-782-3. Jain, Manju (2009). Narratives Of Indian Cinema. Primus Books. ISBN 978-81-908918-4-4. Jess-Cooke, Carolyn (2009). Film Sequels: Theory and Practice from Hollywood to Bollywood. Edinburgh University Press. ISBN 978-0-7486-2603-8. Khan, Mohammad Zahir (1981). Dacoity in Chambal Valley. National. Prasad, M. Madhava (1998). Ideology of the Hindi Film: A Historical Construction. Oxford University Press, Incorporated. ISBN 978-0-19-564218-6. Rao, Maithili (2003). "1976–1989: Rebels without a Cause". In Gulzar; Nihalani, Govind; Chatterjee, Saibal. Encyclopaedia of Hindi Cinema. Encyclopædia Britannica, Popular Prakashan. ISBN 978-81-7991-066-5. Roy, Sharmishta (2003). "Art Direction: Sets, Reality, and Grandeur". In Gulzar; Nihalani, Govind; Chatterjee, Saibal. Encyclopaedia of Hindi Cinema. Encyclopædia Britannica, Popular Prakashan. ISBN 978-81-7991-066-5. Sardar, Ziauddin (1998). "Dilip Kumar Made Me Do It". In Nandy, Ashis. The Secret Politics of Our Desires: Innocence, Culpability and Indian Popular Cinema. Palgrave Macmillan. ISBN 978-1-85649-516-5. Sparks, Karen Jacobs (2008). Encyclopædia Britannica 2008. Encyclopædia Britannica. ISBN 978-1-59339-425-7. Statistical Abstract of the United States: 1977 (PDF). US Bureau of the Census. 1977. Retrieved 13 April 2013. Varma, Pavan K. (2010). "Creativity and Distortion". Becoming Indian. Penguin Books India. ISBN 978-0-670-08346-6. Zankar, Anil (2003). "Heroes and Villains: Good versus Evil". In Gulzar; Nihalani, Govind; Chatterjee, Saibal. Encyclopaedia of Hindi Cinema. Encyclopædia Britannica, Popular Prakashan. ISBN 978-81-7991-066-5.